The curator of “Transformed by the Light: was inspired by a difficult topic to produce a provocative, innovative exhibition, a sophisticated interpretation of the way that new technologies of lighting changed New York City. While not every element is successful, and not every visitor will enjoy it as much as I did, it’s a show no visitor will forget. The exhibition breaks new ground with an interpretation of the way light changes the city. It does this not just in words, but in the display itself. Indeed, more than almost any other exhibition I’ve seen, this exhibit uses the artifacts and settings to make its historiographic points. That’s rare, and deserving of notice. Of course, the topic lends itself to exhibition; it’s about seeing, and being seen. The exhibition is a series of recreated settings, times and places that were transformed by the application of new lighting technologies in the twentieth century. These settings span a remarkable range of sites and styles, from the bedroom, where light can chase away nightmares, to the city street, to the storefront window and the advertising sign. Some, like the street and the advertising sign, make superb use of rare and important original objects. Others, like the store window and the disco room, are recreations—sometimes successful, sometimes not. “Transformed by the Light” brings ideas and artifacts together in a way that’s all too uncommon. There are significant collections on display in the exhibition, mostly worked into appropriate settings. A collection of lighting devices is shown in a store display. Some very early technologies are shown in a setting on offices. The displays of historical artifacts do not always work; design problems that occasionally make them hard to see, and in some cases, as with the lighting devices, the setting can’t carry the weight of the artifact display. The combination of museum labels and settings is hard to pull off, and “Transformed by the Light” is not always successful: words on the wall of a family living room, for example, look odd. Indeed, this might be the show’s most significant flaw: it doesn’t quite have the courage of its convictions to drop the didactic when it might, or to hide it better. Still, when the conceit works, though, the effect is quite astonishing. The streetscape is breath-taking. The section on Broadway (below), with its array of historical stage lighting illuminating significant costumes, and showing off the show control for the exhibition, is brilliant. And even the disco room, more a display of the latest lighting technologies than a good historical setting—or, more accurately, a combination of the two—works surprisingly well. • The exhibition has some of the best-written wall labels I’ve ever seen. They are short, pithy, provocative, easy to read and memorable: they are models of their kind. • Some of the details of case design are quite poor, making artifacts inaccessible to visitors in a wheelchair, or to short visitors. 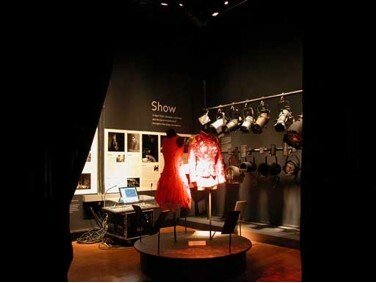 • The lighting effects in the exhibition were produced by ten volunteer lighting designers. Each was showing off, which in part explains the visual cacophony of the exhibition experience—but on the other hand, the exhibition shows a remarkable diversity of design styles; it’s never boring. And the curator and designer deserve kudos for taking advantage of the free design talent; the show would otherwise be beyond any museum’s budget.